The Liberty came into this afternoon’s contest riding a season high 6 game-winning streak. They were looking to win their 7th consecutive game against Brittney Griner, Diana Taurasi and the rest of the Phoenix Mercury. Tina Charles has been playing at an MVP level and the team is playing with great energy and hustle. The Liberty are 10-4 and were poised to gain a strong hold of the Eastern Conference. Tina is averaging 22 points per game, which leads all WNBA players. The Mercury came in with a 5-9 record as they have struggled a little bit out of the gate. This was Diana Taurasi’s first game at MSG since she returned to the WNBA after she sat for a year. The Liberty paid tribute to the inaugural team that was in attendance as they continue to celebrate the WNBA’s 20th season. The original team featured players like Rebecca Lobo and Theresa Weatherspoon. The crowd enjoyed the celebration. The Mercury jumped out to an early 17-4 lead in the opening minutes of the game as they established Brittney Griner and the shot from behind the arc. They shot 4-6 in the first period. The Mercury put Griner on Tina Charles, which seemed to slow her down a bit. Sugar Rodgers hit the first shot from behind the arc for the Liberty, which seemed to wake up the home team just a little bit. They got the lead under 9 as Swin Cash hit a jumper from the free throw line to cut the deficit to 9-18. Taurasi was active early as she had 8 points in the opening period. As the Liberty cut down the deficit the crowd came alive for the home team. With 2:18 left in the first Charles, guarded by Grinder used a nice fake to get her off her feet and drove to the basket for a beautiful basket. At the end of the first however the Mercury led 28-20. At the beginning of the second period the Liberty started on an 8-0 run to tie the game igniting the home crowd into a frenzy. It was a Tina and Sugar show as they led the charge. Candice Dupree had 10-points for the Mercury in the first half she would end the game tied for game high in scoring. Both teams battled in the first half, as the score was close throughout. The Liberty pulled to within one after a 3-point shot by Shavonte Zealous and they went into the half down 46-47. In Liberty took a 6-point lead early in the third after a Mercury turnover. Sugar Rodgers hit a 3-point shot to start the mini run, which led to the Liberty’s biggest lead at that point of the game. Brittney Griner was in foul trouble for most of the contest, she could not establish herself until late in the game. For some reason the Mercury did not feed Griner the basketball, as dominant as she can be they relied on the outside shot. They were 5-15 heading into the fourth period from behind the arc. They did not share the ball as they only had 6 assists heading into the fourth compared to the Liberty’s 17 assists. The Liberty took an 82-76 lead with 3 minutes left in the game after a 3-point shot by Sugar Rodgers. However that lead would quickly disappear and so did the Liberty’s bid to win 7 consecutive games. Brittney Griner and Diana Taurasi came alive towards the end of the 4th period. Griner scored 10-points in a 4 minute span and Taurasi finished the job as she was fouled on a 3 point attempt. She hit the free throws and tied the game at 89 a piece. 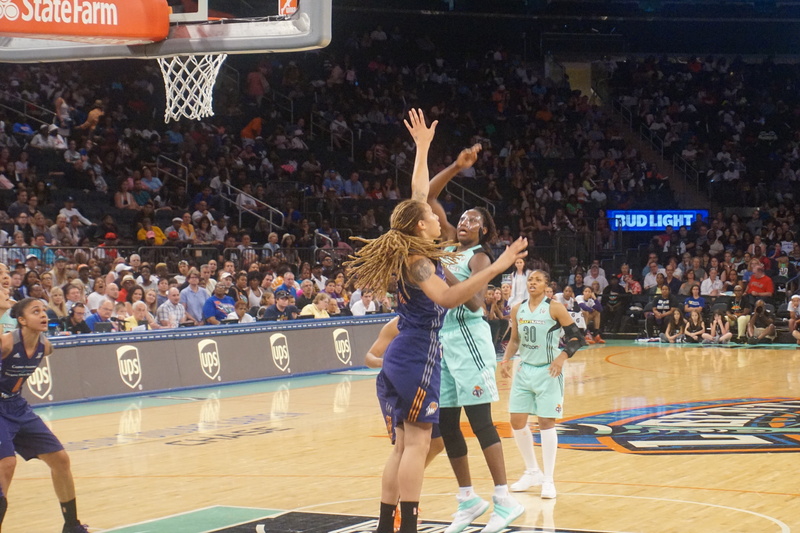 The Liberty had one more shot to win the game in the end of regulation however Tina Charles’ jumper fell short and the Mercury secured the rebound. The overtime period belonged to the Mercury, they scored 15-points in the period, their stars willed them to victory this afternoon. They had a balanced scoring attack with all five of their starters in double figures led by Candice Dupree who had 26-points. Taurasi finished with 24-points while Griner added 16-points and 7 rebounds for the visiting squad. The Liberty were led by Tina Charles and Sugar Rodgers however there was not a balanced scoring attack for the home team. There were only 3 players in double figures and the team shot 45% from the field. The Liberty led in almost all categories for most of the game. They had 22 assists for the game and 41 rebounds. This game came down to execution in the finals minutes and costly turnovers. The winning streak is over, however the Liberty still lead the Eastern Conference and look to rebound from this tough loss when they go on the road for a rematch with the Minnesota Lynx.